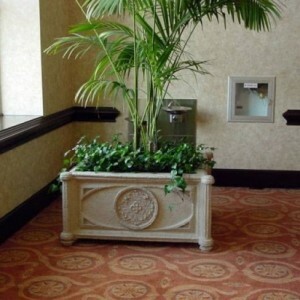 Planters, receptacles, benches, tables, urns, tree grates, you name it, Stromberg can make it in GFRC. Stromberg is the forerunner in the use of glass fiber reinforced concrete and they have 30 years of experience in its use. Site amenities in Stromberg GFRC come in your choice of sizes and shapes and they really add a natural touch to your landscaping. Check out Stromberg’s huge selection of beautiful planters: Roman, Mediterranean, trough planters, any of these would be a great addition to your home or business décor. GFRC site amenities can be used indoors and out. You can use them on a porch, patio, deck, entryway or hallway. Address plaques in GFRC are one of Stromberg’s most popular site amenities. Additionally, these plaques can also be informational, quote or used beside a pool or deck. Glass fiber reinforced concrete is the best choice for this amenity because it’s such a durable material. You never have to worry about plaques rusting or corroding. Plaques from Stromberg can stand up to any kind of weather condition and will be an elegant addition to your home’s exterior. Affordability, great selection and excellent customer service are just a few of the advantages offered by Stromberg Architectural. Stromberg professionals are knowledgeable and easy to work with. They work hard to provide you with a great experience and to make sure you get exactly what you want in your GFRC site amenities. GFRC has found widespread use in the building industry and Stromberg can provide you with the expertise to help you choose the right designs for your next business or residential project. Stromberg GFRC can be made in multiple shapes, sizes and colors so your design options are greatly increased. GFRC by Stromberg is an innovative material. Designers use it for nonlinear buildings and applications as well as for traditional, classical and modern projects. Glass fiber reinforced concrete by Stromberg is fire-resistant. Glass fiber reinforced concrete can reproduce the look and feel of natural stone such as granite, limestone and sandstone. It can also be made to mimic terra cotta and wood. GFRC weighs much less than traditional concrete so the cost of structural framing, footings and foundation is greatly reduced. Stromberg Architectural is made up of professionals that treat their customers with fairness, honesty and courtesy. They promptly respond to your needs and apply their 30 years of experience to make sure your GFRC site amenities are up to your standards. Stromberg experts will help with CAD details, design assistance and specifications. Contact them today at 903-454-0904.